I have quite dehydrated skin and suffer from hormonal breakouts on my chin area that leave red scars on my pale skin for months. Lately I've found a good combination of products that have been keeping my skin a lot more hydrated and breakout free so I thought I'd let you know what I've been using. This post doesn't include cleansers as I already wrote a blog post on my favourites last month (link). I've really fallen in love with La Roche-Posay products as they seem to be really effective, don't irritate the skin and aren't too costly. The Physiological Soothing Toner (link) is an amazing toner as it's gentle on the skin, has a lovely soothing scent and really calmed my skin down. La Roche-Posay Effaclar Duo+ (link) can be used all over the face but I use this as a moisturiser for my chin only and I've found that the breakouts I had, reduced fairly quickly. Any twinges I've felt under my skin where a spot would have normally formed have completely disappeared after using this and the spot didn't raise its ugly head (pun intended!). I've also noticed a reduction in spot scars which is fantastic as I hate it when I look like I have loads of spots when I don't and they are just marks left from spots I had months ago! 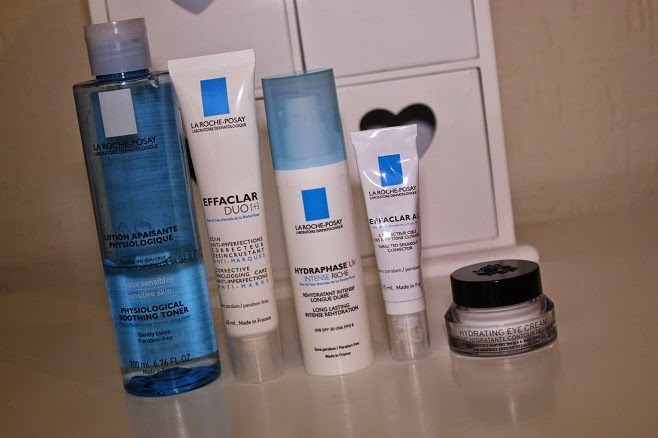 I tend to use this product mostly in the morning and at night time where I feel like a spot could possibly be coming on, I've been using the La Roche-Posay Effaclar A.I. (link) and again, it's stopped the spot in its tracks! The Effaclar A.I. is more of a targetted breakout corrector and Effaclar Duo+ is more of a whole face moisturiser/treatment but I find that neither of them are drying at all on the skin which is something that tends to be the case with other blemish treatments. I'm so glad I discovered both of these products. The La Roche-Posay Hydraphase UV Intense Riche SPF20 (link) has been my 'rest of my face' daytime moisturiser for several months and it's perfect for my skin. It provides the perfect amount of moisture without being too heavy. It's more of a lotion texture than a cream so it's still quite light, despite being 'intense'. You can get both light and riche versions of this moisturiser and they both come in SPF and non SPF formulas so I'd definitely be interested in those as well but I've definitely been loving the SPF20 version as it's started to get a bit warmer in the UK. I'm going to switch to some higher SPF products for the next few months but I'll be looking to repurchase the Hydraphase later in the year. I've tried so many eye creams over the years and this Bobbi Brown Hydrating Eye Cream (link) is one of the best. It doesn't feel super heavy on the eyes but it's really moisturising and creates a really good base for my concealer. It's not cheap at £31.00 but I'm happy to pay that price for this product as it really works well on me. 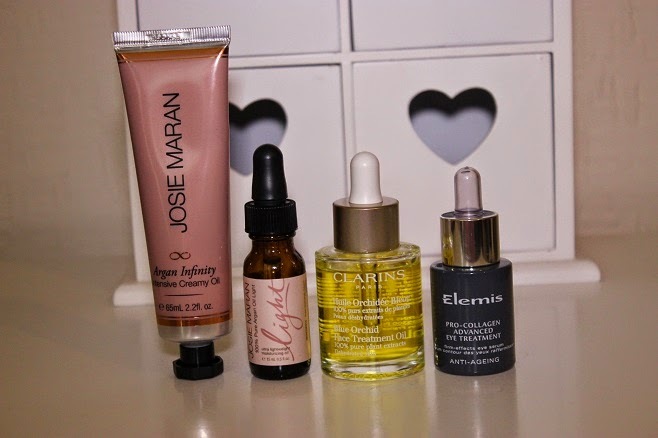 I mentioned the Josie Maran Argan Infinity Intensive Creamy Oil (link) in a recent post here about my favourite Josie Maran products but I'll just quickly say that I use this at night time for an intensely hydrating boost for my skin that makes it look radiant by morning. The perfect, daytime friendly version of this is the Josie Maran 100% Pure Argan Oil Light (link). It's an oil, as the name suggests, and it just feels so luxurious on the skin. It melts into the skin straight away on application and it really adds a lot of moisture to the skin without any grease. I use this instead of a serum before my moisturiser and it just adds a nice extra layer of hydration. I find that my makeup goes on very smoothly if I've used this as part of my routine. 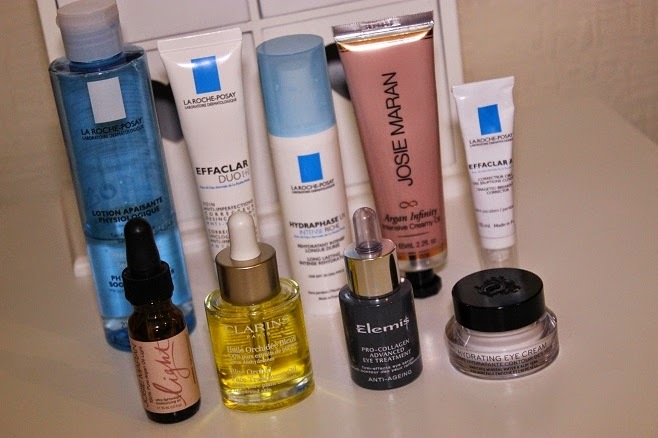 Some additional night time products in my stash are the Clarins Blue Orchid Face Treatment Oil (link) and the Elemis Pro-Collagen Advanced Eye Treatment (link). I use the Clarins oil about once a week before bed and my skin just drinks this up overnight and I wake up feeling super smooth and my skin has a glow that shines through under any makeup I've got on. The Elemis eye treatment is a light serum that is dispensed using a pipette. A few drops are all I need for both eyes and this is another super hydrating product that leaves my under eye area really moisturised by morning. So these are the products that are doing well for me at the moment. What skincare products are you getting great results with?